The more orthodox twentieth-century answer to the question of when and how the Americas were first 'invaded' or colonised by humans was that by around 13.5 ka (i2,ooo-i4.C or radiocarbon date), migratory Siberian hunters arrived in Alaska on foot from northeast Asia. 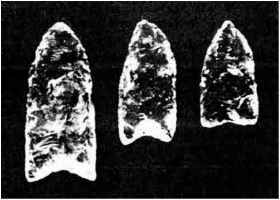 They are known as the 'Clovis' people, because of their distinctively fashioned stone spearheads that were first found in the 1930s at Clovis in New Mexico. Small bands of Clovis hunters walked across the narrow Bering Strait close to the Arctic Circle when the sea level was lower and it was dry land. The broad flat plain of the Bering Strait is commonly referred to as Central Beringia. A reconstruction of the Beringian landbridge between Siberia and North America during the Last Glacial Maximum c. 18,000 years ago, with lowered sealevels and ice cover. glacier covered much of the Pacific coast as far south as Seattle. Even where the coastline was free of ice, the high Coastal Ranges come down to the sea with precipitous seacliffs, thus blocking any coastal passage. The timing of the glaciation precludes the existence of any ice-free corridor between 22,000 and 13,500 years ago, so how did the Clovis hunters enter the continent and spread south by around 13.5 ka? Fragmentary but growing evidence suggests that the Clovis hunters were not the first people to set foot on the continent. In addition, detailed investigation of the northeast Pacific coastline of Canada has raised the possibility that the earliest human immigrants into the continent might have taken an offshore coastal route rather than an inland one. Recent modelling of the complex interactions between climate change, ice movements, the rise and fall of sea level and migrating coastal environmemts with their plants and animals suggests that the British Columbian coastal terrain was ice free by around 16 ka (13.8 ka-i4.C years). Edible molluscs, fish such as herring and sea mammals (seals and sea lions) were also present and easily obtained as food. Although on the British Columbian mainland sea levels were up to 120 m higher than during the glacial maximum, they were more than 150 m lower out on the Queen Charlotte Island archipelago because of differential ice loading and offshore upward bulging of the continental crust. Exposure of the offshore islands to marine climate influences meant that they were ice free from around 16 ka until 12 ka (10.25 ka-i4.C years), when rising sea levels drowned the coastal route. But by then the inland ice-free corridor was well established. Sea levels began falling around 100,000 years ago, rose again during the warm interval 50-23 ka, and eventually dropped to some 90 m below the present level during the glacial maximum around 18 ka. The desolate Beringian dry-land connection between the Asian and American continents was exposed over the whole of this interval and remained so until around 15.5 ka, when climate warming began. 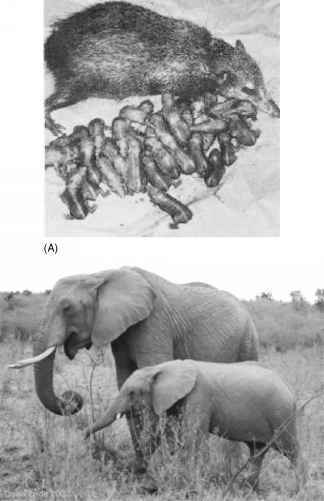 There is fossil evidence that some 22 species of mammal migrated from Asia via Beringia into the Americas, including mammoth, musk-ox, caribou, moose, grizzly bear, polar bear and saiga antelope. Rising sea levels gradually reduced the Beringian connection until it was finally submerged around 10 ka. One might imagine that humans could have used the new 'freeway' as long as 40,000 years ago. But there is absolutely no material evidence for such an early entry by humans into the continent. Indeed, there is frustratingly little evidence at all for any human habitation in the Americas before 15,000 years ago, and there are very few finds older than 14,000 years ago. Particularly frustrating is the lack of human bones; most of the evidence comes from much more easily preserved stone tools. Part of the reason may be that the evidence is now below sea level on the Beringian plain or the drowned Pacific coast strip of Alaska and Canada. Be that as it may, the main reason probably has to do with the very inhospitable climate and environment of Beringia, which was not accessible even for tough Siberian hunters until the glacial ended and climate began to improve. No sooner had the last glacial reached its coldest phase around 18,000 years ago than the climate began to swing back into a warm phase punctuated by fits and starts and reversals. Until very recently, the earliest archaeological evidence for human occupation of Siberia dates back to around 21 ka around the shores of Lake Baikal, over 4000 km to the southwest of the Beringian plain. But in 2004 Russian archaeologists announced the discovery of a spectacular new find of 30,ooo-year-old (27,000-14C years) artefacts in northern Siberia (near Kazachie on the Yana River) and 500 km inside the Arctic Circle. The artefacts found at the Yana site include spear foreshafts fashioned from mammoth ivory and rhino horn, which are remarkably similar to those ivory foreshafts made by the American Clovis people over 15,000 years later. Foreshafts allowed hunters to replace broken spear points quickly and reuse the spears. However, the woolly rhino became extinct around 17,000 years ago and did not colonise the Americas, and so the Clovis people had no option but to use the more brittle mammoth ivory. Problematically, there are also stone tools that do not bear any resemblance to Clovis ones, so there remain big questions as to the possible direct connections between these Yana River Siberians and the Clovis people. The debris of animal bones (some 800) found at the Yana site includes the remains of mammoth, bison, reindeer, horse, large lion-like predatory cats and plant fossils, which all point to a cool, dry steppe climate with grasses, and stands of larch and birch. But this was before the climate descended into the cold depths of the last glacial. What happened to the Yana people when the last glacial took grip and transformed their 'happy hunting grounds' into a desolate tundra wasteland significantly colder than it is today we will never know, but they certainly did not stay in the Yana River valley; that would have been suicidal.